Sometimes the initial steps of working with a new API can be hard, often working out how to authenticate and call the APIs can be the hardest part. I have found that if I break it down into industry standard tooling I can often get a better understanding of how to form this in other languages which I use. For REST other than calling the API through an API Explorer (like the awesome API explorer built into the VMware Cloud on AWS console) clearly curl is the easiest and probably best industry standard way to test a REST based API. With this in mind I wanted to show an example of how to use the VMware Cloud on AWS API using CURL, the below example shows how to exchange your refresh token (obtainable from your account) for an access token and then use this to work with all the subsequent APIs in VMware Cloud on AWS or as my example shows, listing the organizations I have access to. You can download this sample from code.vmware.com here. 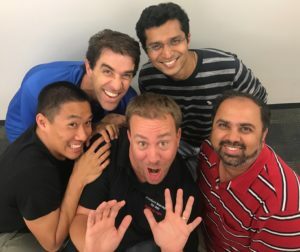 This year I was introduced to a new show put together by Amy Lewis from http://commsninja.com/ and her team called Tech Confessions or as I like to call it “Bedside confessions of a geek”, unofficially of course! In this show I was able to relax on the comfy couch while Amy quizzed me on how i got started with virtualization, there was something about that couch that made me very relaxed as I think I took Amy pretty much through my entire career up to the point where I made it on stage with Pat during the VMworld 2017 Barcelona conference. I was proud to be the first of many to share their bedside confessions so make sure you subscribe to the youtube channel or the podcast to keep up to date with other people sharing their software defined experiences. For now, here is my video to keep you going…. 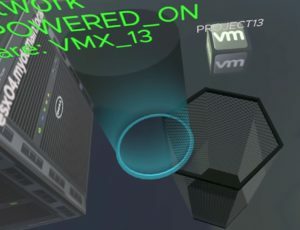 It gives me great pleasure to announce a new open source project from VMware called VMware VR Datacenter Experience, this is an immersive experience that allows you to put on your virtual reality headset and take yourself into a virtual management environment where you will be able to control your vSphere Environment with the wave of a hand or click of a button. 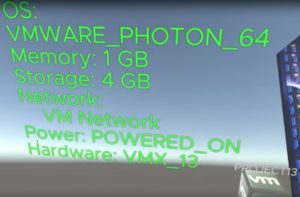 The VMware VR Datacenter Experience allows you to use a HTC Vive headset to enter a virtual datacenter where a virtual representation of each of your hosts is created by integration with the vSphere 6.5 REST API, once these are created the VM’s are dropped onto these hosts, one for each VM currently registered with the host. In this environment you are able to teleport yourself to each of these hosts and interact with the VMs. 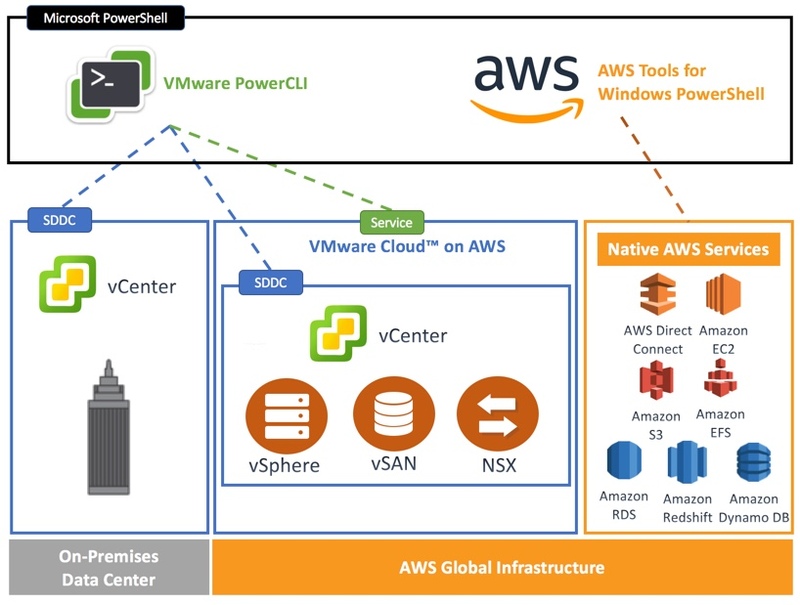 We even extended it to work with VMware Cloud on AWS (VMC) where you could literally throw (vMotion) your VM’s from your On-Premises datacenter into VMC. Showing you the 2D pictures of this virtual reality environment really does not do it justice, you need to try it to believe it! innovation, personally I love working for a company that provides this level of free thinking! 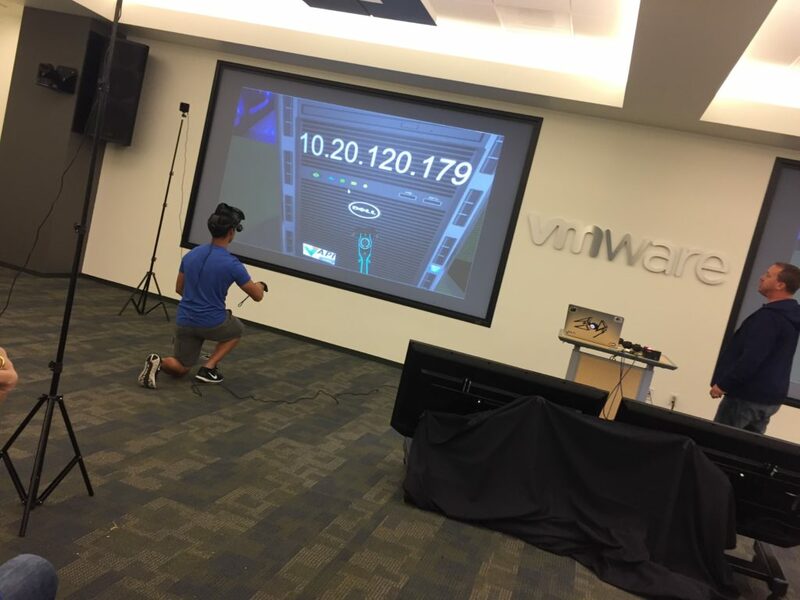 Together with William Lam, Yateendra Kulkarni, Vinod Pai and Steve Trefethen, I put a team together and we set out to work on what a VMware Datacenter would look like in Virtual Reality. I should mention at this point that none of us had developed for VR before, in fact we had never even used the IDE (Unity) before, that was fun! After a couple of days we were pleased when we managed to produce a single host and VMs on that host all by calling the vSphere 6.5 REST API. After this and some internal marketing and some spare time hacking away at the project we came up with something pretty cool that later allowed me to realize one of my bucket list items and present on the main VMworld Keynote stage with Pat Gelsinger (VMware CEO). If you didn’t get a chance to watch the VMworld Barcelona Keynote then please do take 5 minutes out of your time to watch the demo below that shows the full remit of what we expanded this project to work with. The initial project is now available and ready for you to download, it has been cut down to its basics so we can build on it and ensure the code we are adding and the functionality is based around user input. Normally when I create blogs and use the word “virtual” it of course refers to the awesome virtualization technology invented by VMware, this post however is a little different but still just as awesome! The virtual word that I speak of in this post refers not just to virtual machines but also to virtual reality. 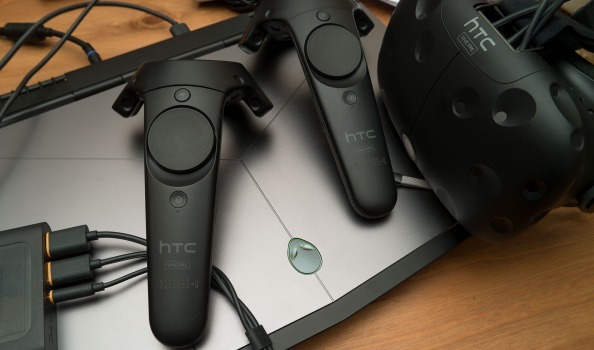 Having purchased a HTC Vive earlier this year and being totally inthralled by virtual reality (VR), I started to wonder what an enterprise world would look like if we all had VR headsets, how would we control todays applications in a VR world? Want to win a HTC Vive and Alienware laptop? During this session we will be showing some cool integrations with Virtual Reality and VMware products. As part of this session we will also be giving away a fully spec’d Dell Alienware laptop and a full HTC Vive headset and accessories. Believe me, this is an awesome piece of equipment that will blow your mind! To enter all you need to do is attend the following session, watch the demo and wait for the chance to win this amazing prize! Im looking forward to blowing some minds in this session! Back in the day when I could spend time working on vCheck (I miss those days!) 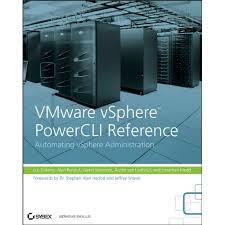 I always wished there was a programmatic way to look at the data in the VMware KB articles and be able to mine the information for potential issues or be aware of enhancements to the configuration I had made with my specific version of vCenter or other VMware products. Recently I managed to find time to install this in my home lab and get started, I have to say, I was impressed. Runecast is a virtual appliance which checks your environment, vCenter, ESXi servers and VMs to ensure they are running at peak performance with no known configuration issues or security issues. The appliance is updated from the internet or can also be updated via a ISO image attached to the virtual appliance for environments without internet access. It is updated with information which has been mined from the VMware KB articles and is used to proactively check log and configuration for issues in the virtual environment. Recently I was contacted and asked if there was a way to retrieve information about the NVMe Drives in an ESXi host, this information is easily accessible via ESXCLI using the “nvme” namespaces. Through PowerCLI this can be easily called and then each feature can be called under this namespace to give you detailed information on the NVMe devices in your ESXi host. The reason they wanted to do this was to first check the firmware on all the NVMe devices in a cluster to see if they are at the latest revision. Another reason they wanted this script was in case one of the NVMe devices was behaving differently than the others it would be an easy way to compare the devices. 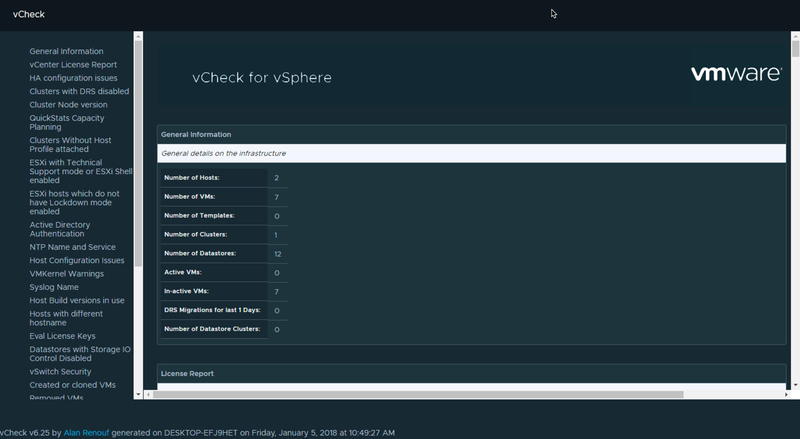 Recently I was contacted by a customer who needed to be able to update their VSAN Hardware Compatibility List in the VSAN Health Check but was unable to do so via the GUI as their vCenter servers did not have internet access. This is a common setup as a lot of customers clearly do not want their Server infrastructure having a direct connection to the internet due to strict security requirements. The problem is when the vCenter server needs to update the VSAN HCL database file it requires a connection to the internet to do this. Whats more, this specific customer had several VCs and was getting quite frustrated with the warning that the HCL database had not been updated. Rather than turning this feature off the customer was looking for a way to update the HCL from a computer that had internet access – his desktop. New in PowerCLI 6.5 (backwards compatible to previous versions) is a cmdlet that will help us achieve this… Update-VSANHCLDatabase, as you can see from the below image this can be run either grabbing the database information directly from the internet or if you add the “FilePath” parameter you can load the database locally.